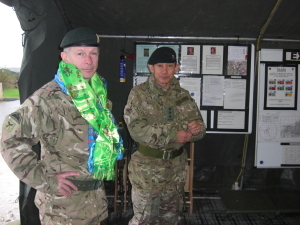 As part of a new capability, the Brigade now has Gurkhas in HQ Allied Rapid Reaction Corps (ARRC) providing the Close Support Troop responsible for force protection of the deployable 3 star NATO HQ. 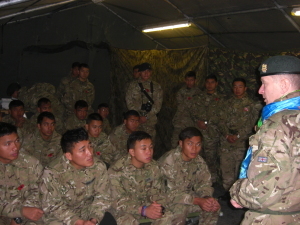 26 RGR soldiers are now based in Gloucester, the home of HQ ARRC. 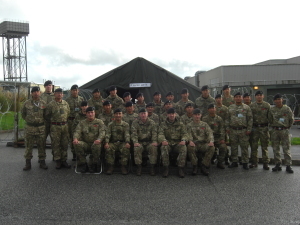 The Troop recently deployed to RAF St Mawgan in Cornwall as part of the very large ARRC Exercise ARRCADE FUSION with some 3,000 personnel in a deployable HQ set-up with representatives from many NATO and non-NATO nations. 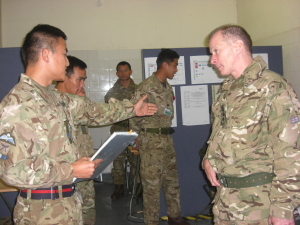 On 10 and 11 November, Colonel Brigade of Gurkhas went to visit them and also 250 Signal Squadron QG SIGNALS who were also supporting the exercise. The RGR soldiers arrived in Gloucester in October and are now well settled. The families are living together close to the camp and are enjoying exploring the new location. They are in the process of establishing a meander and look forward to visitors from the Brigade. In 2016 8 QGE will arrive to take on the engineer section responsibilities.